Arthur Charles Vincent Wickard, 54, of 300 North Centre Street, died yesterday in Memorial Hospital after an illness of two months. A son of Mrs. Sue Anna (McKenzie) Wickard and the late Riley Wickard, he had been employed in the bottling plant of the Cumberland Brewing Company. He was a member of Local 265, Brewery Workers Union, and St. Patrick's Catholic Church. Surviving besides his mother and widow, the former Helen Deter, are five sons, Arthur, Charles, Harold, Louis and Roy Wickard, at home; two daughters, Ruth and Marlene Wickard, also at home, and a brother, Sylvester Wickard, city. The body is at the residence. A requiem mass will be celebrated Wednesday at 9 a.m. in St. Patrick's Church. Burial will take place in the parish cemetery. Mrs. Frances Emily Wickard, 55, wife of Sylvester Wickard, 108 West Third Street, died yesterday in Memorial Hospital where she was admitted on February 16. She was an employe of the Viaduct Inn. A native of Frostburg, she was born on July 7, 1903 and was a daughter of the late Samuel T. and Martha E (Reese) Mears. Mrs. Wickard was a member of the Episcopal Church. Beside her husband, she is survived by a daughter, Mary Louise Wickard. at home: a brother, Thomas B. Mears, city; two sisters, Mrs Wallace Swayne and Mrs. Joseph Fisher, both of here. The body is al the George Funeral Home, where friends will be received from 2 to 4 p. m and from 7 to 9 p. m. A service will be held at the funeral home tomorrow al 2 p. m with Rev. H. M. Richardson, rector of Emmanuel Episcopal church, officiating. Interment will be in Sunset Memorial Park. Mrs. Susana Wickard, 81, of 110 West Third Street, died yesterday in Sacred Heart Hospital shortly after being admitted. A native of Frostburg, she was a daughter of the late James and Sarah (McKenzie) McKenzie. Her husband, William R. Wickard, preceded her in death. She was a member of St. Patrick's Catholic Church. Survivors include a son, Sylvester W. R. Wickard, this city; two sisters, Mrs. R. C. Hoenicka and Mrs. Grover May Zink, both of this city, and seven grandchildren. The body is at the George Funeral Home where the Very Rev. J. Lawrence Kilkenny, pastor of St. Patrick's Church, will conduct services Saturday at 10:30 a. m. Interment will be in St. Mary's Cemetery. Sylvester William Wickard, 70*, of 700 LaFayette Avenue, died Friday in Sacred Heart Hospital. Born in Cumberland, he was a son of the late Riley and Suzanna (McKenzie) Wickard. His wife, Frances (Meirs) Wickard, preceded him in death. Mr. Wickard was a retired employe of the Queen City Brewing Company. A daughter, Miss Mary Louise (Betty) Wickard, at home, is the only survivor. The body is at the Scarpelli Funeral Home, where friends will be received from 2 to 4 and 7 to 9 p.m. today and tomorrow. Services will be conducted in the funeral home tomorrow at 2 p.m. Interment will be in Sunset Memorial Park. HARDY COUNTY NEWS - G. W. Wickman, who has been quite sick for some time, died at his home near Glebe, this week. The remains were taken to Wheeling for interment. Mrs. Bessie Jane Wiegand, 72, of 23 Harold Street, LaVale, died Wednesday at Memorial Hospital. Born February 26, 1913, she was a daughter of the late Daniel Eckhard and Lillie Dale (Hawkins) Eckhard. Mrs. Wiegand was formerly employed in the coning department of the Celanese Corporation. She was a charter member of the LaVale Church of the Brethren and also belonged to the Good Fellowship Club of Cumberland. Her husband, Charles R. Wiegand, died in 1975. Surviving are two sisters, Mrs. Pearl Ecker, Hagerstown; Mrs. Marie Wentz, Philippi, W. Va., and several nieces and nephews. Friends will be received at the George-Upchurch Funeral Home Friday from 2 to 4 and 7 to 9 p.m. Services will be conducted at the funeral home Saturday at 10 a.m. by the Rev. Earl Harper. Interment will be in Davis Memorial Cemetery. Charles (Swifty) Wiegand, 70, of 23 Harold Street, LaVale, was dead on arrival yesterday at Sacred Heart Hospital. He had been ill for several years. Born in Cumberland, he was a son of the late Richard and Hermania (Schultz) Wiegand. Mr. Wiegand was a member of the LaVale community Church of the Brethren and was a retired employe of the Cumberland Matress Factory. Surviving are his widow, Mrs. Bessie J. (Eckhard) Wiegand; three sisters, Mrs. Mary C. Sines and Mrs. Amanda Percy, both of this city, and Mrs. Theresa Shipes, LaVale. Friends will be received at the George Funeral Home today from 7 to 9 p.m. and tomorrow from 2 to 4 and 7 to 9. Services for Charles (Swifty) Wiegand, 70, of 23 Harold Street, LaVale, who died Saturday, will be conducted tomorrow at ll a.m. in the George Funeral Home by Rev. Guy Ludwig. Interment will be in Davis Memorial Burial Park. Pallbearers will be Thomas Keiser, James Sullivan, Paul Lowery, Jack Lowery, Walter Hensel and Curtis Smith. Friends will be received in the funeral home today from 7 to 9 p.m.
Frederick W. Wiegand, 64, Narrows Park, died last night after an illness of a year. A native of Cumberland, he was a son of the late Henry and Annie (Schaefer) Wiegand, and he was employed by the American Oil Company as a salesman for 20 years. Mr. Wiegand was a member of Zion Reformed Church, Ohr Lodge No. 131; AF & A Masons and was 32nd Degree Mason. Besides his widow, Mrs. Charlotte (Holder) Wiegand, he is survived by a son, Harry H. Wiegand, Elkins, W. Va., a daughter, Mrs. James Hodgson, Dayton, O.; four brothers, Henry, Reading, Pa.; Carl, Birmingham, Ala; Franklin, Wilkinsburg, Pa.; William, this city. Two sisters, Mrs. E. B. Miller, this city, and Mrs. E. C. Hendrickson, Aiken, S. C., also survive. ELKINS, W. Va., - Harry H. Wiegand, 68, a resident of here and native of LaVale, Md., died Wednesday at Davis Memorial Hospital where had been a patient since since February 14. Born June 30, 1903, he was a son of the late Frederick and Charlotte (Holder) Wiegand. Mr. Wiegand was a graduate of Allegany High School, Cumberland, and a veteran of World War II. He was a retired sales representative for Standard Oil Company of New Jersey with 29 years' service. Surviving are his widow, Thelma (Browning) Wiegand; a daughter, Mrs. Betty Jane Dicks, Mt. Pleasant, S. C.; a foster sister, Mrs. Nora Hodson, Dayton, Ohio; a grandson and two great-grandchildren. Graveside services will be accorded at Greenmount Cemetery, Cumberland, today, at 2:30 p.m.
John Henry Wiegand, 67, of 409 Louisiana avenue, died at 7 a. m. today two hours after being stricken with a heart attack. He had been day janitor at the City Hall since 1932 and was a former bartender. A native of Frostburg, he was a son of the late John H. and Mary (Baum) Wiegand. His wife, Mrs. Rose B. (Folk) Wiegand, is the only immediate survivor. Mr. Wiegand was in apparent good health yesterday, working as usual. Mrs. Juanita May Wigfield, 56, of RD 2, Baltimore Pike, died yesterday at her residence. Born December 2, 1919 here, Mrs. Wigfield was a daughter of the late Carl Edward and Edith May (Robison) Rice. Mrs. Wigfield was a member of Pleasant Grove Methodist Church. Surviving are her husband, Floyd Wigfield; a son, Steven Wigfield, at home; a daughter, Mrs. Sharon Stevens, Hagerstown; two brothers, Theodore Rice, Baltimore Pike; Roy Rice, Huntington, Ind. ; two sisters, Ursala Brunner, and Gwendolyn Simpson, both of this city. Friends will be received at the Scarpelli Funeral Home today from 2 to 4 and 7 to 9 p.m. A service will be conducted there tomorrow at 2:30 p.m. Rev. Steve Robison will officiate. and interment will be in Hillcrest Burial Park. Pallbearers will be Ronald Rice, Adolph Norris, Harman Robinette, Roy Gross, Lester Dolan and Harry Wilson. James B. Wigger, aged 61, husband of May Wigger, 482 Williams street, died this morning in Allegany Hospital, where he was admitted last night, following a paralytic stroke. He was employed for a number of years as track foreman for the C. & P. Railroad and was a son of the late Bernard and Mary Wigger. Besides his widow he is survived by the following sons and daughters: James B. Wigger Jr., Ralph Leo Wigger, John F. Wigger, William Wigger, Mrs. Ethel Neis, Mrs. Frederick Wilson, this city; Mrs. Wiliam J. Abel, St. Charles, Ill., Mary A. Wigger, at home and Miss Angelia A. Wigger, R. N. of Buffalo, N.Y. Funeral services will be held in St. Mary's Catholic Church. Funeral services for James B. Wigger, 61 years old, 482 Williams street, who died yesterday morning at Allegany Hospital, where he was admitted Thursday night, following a parlytic stroke, will be held at 9 a.m., Monday at St. Mary's Catholic Church, with interment in St. Patrick's Cemetery. James Bernard Wigger Jr., 73, of 1317 Kentucky Avenue, was dead on arrival yesterday at Memorial Hospital. He had been ill several days. Born in Allegany Grove, he was a son of the late James B., and May Rose (Shank) Wigger Sr. He was a retired Potomac Edison Company electrician, a member of Cumberland Aerie 245, FO Eagles; aned St. Mary's Catholic Church. He was preceded in death by his wife, Mrs. Bessie M. (Beck) Wigger. Surviving are one son, Melvin G. Cline, this city; one daughter, Mrs. Paul Laber, city; one foster daughter, Mrs. William Harvey, city; two brothers, Ralph Wigger, city and Vincent (Bennie) Wigger, LaVale; four sisters, Mrs. Ruth Abel, St. Charles, Ill.; Mrs. Cecelia Clise, Frostburg; Mrs. Margaret A. Jones, LaVale, and Mrs. Angela Schultz, Eggertsville, N. Y.; six grandchidlren and four great-grandchildren. The body is at the Scarpelli Funeral Home where friends will be received from 2 to 4 and 7 to 9 p.m.
Westernport, Md., Francis Wiland, 20, of 4642 Springdale Avenue, Detroit, who was drowned Tuesday evening in the South Branch of the Potomac river, near Romney, was a native of Moscow, this county, moving to Detroit with his parents, Mr. and Mrs. Harold Wiland, when a boy. He was the oldest child. His body and that of his chum, Harry Ross Pearson, 20, of 13940 Mack avenue, Detroit, now at Boal's Funeral Home, here, will be taken to Detroit late today. The group had only been a the beach about fifteen minutes when the tragedy occurred. They had brought a lunch but decided to first take a swim Besides the two victims the party included Joseph Eloot, Detroit, who was also visiting Wiland's cousin, Miss Winifred Wiland, of Moscow, Nellie Meese, Elizabeth Yates, also of Moscow and Geneva Hyde of Barton. Wiland was a graduate of a Detroit high school and was employed as an attendant at a gasoline station of the Zip Oil Company, there. His mother is the former Miss Madeleine Green, of Moscow. Besides his parents he is survived by three brothers, Bernard, Joseph and William Wiland, and five sisters, Mary Madaline, Margaret, Theresa, Ellen and Barbara Wiland, all of Detroit." Note: St. Gabriel's records show he was buried in Barton at St. Gabriel's Catholic Cemetery August 10, 1940." "The body of Francis Wiland, 20, son of Mr. and Mrs. Harold Wiland, 4642 Springle avenue, Detroit, a native of Moscow, Md., who was drowned Tuesday in the South Branch of Potomac river, was removed to the home of his grandparents, Mr. and Mrs. Henry Wiland at Moscow. He will be buried tomorrow morning at St. Gabriel's cemetery at Barton." Note: St. Gabriel's records confirm he was buried in Barton at St. Gabriel's Catholic Cemetery August 10, 1940." LONACONING — Henry Wiland, 79, retired coal miner, died Saturday night at his residence in Moscow. He was a son of the late William and Jean (Thompson) Wiland. Surviving are his widow, the former Sarah Dorsey; two sons, Howard Wiland, Detroit, and Charles Wiland, Baltimore; two daughters, Mrs. John Donahey, Elm Grove, W. Va., and Mrs. Emily Frankhouser, Fairfax, Va.;19 grandchildren and 21 great grandchildren. Mr. Wiland also leaves two sisters, Mrs. Nell Brewer, Akron, and Mrs. Bertha Welper, of California and three brothers, Michael, Silas and Ely Wiland, all of Akron. The body is at the home where services will be held tomorrow at 2 p.m. Burial will take place in Laurel Hill Cemetery, Moscow. John F. Wiland, 87, Meyersdale, died at 8:45 yesterday morning in the home of his son Homer Wiland, Republic, Pa. A son of Mary & Jeremiah Wiland he was born Jan. 21, 1858 in Maryland. He is survived by the following children: William, Kingwood, W.Va.; Clarence, Cumberland, Md. ; Frank, Salem, N.J.; Homer, mentioned and Mrs. Ray O'Neil, Mrs. Charles Houston, and Mrs. Theodore Baer, all of Meyersdale. There are 26 grandchildren and 5 great grandchildren. Funeral services will be conducted at 2:30 tomorrow afternoon in the home of his son-in-law and daughter, Mrs. & Mrs. Ray O'Neil. Interment will be in the Union Cemetery under the direction of W.C. Price & Son, Meyersdale. GRANTSVILLE - Ralph H. Wiland, 86, of RD 2, Grantsville, died today in Sacred Heart Hospital. Born at New Germany, he was a son of the late Samuel and Henrietta (Broadwater) Wiland. Mr. Wiland was a member of New Germany United Methodist Church and was a retired carpenter and farmer. Surviving are his widow, Lucy (Martin) Wiland; three sons, James Wiland, Cumberland; Paul Wiland, Frostburg; Norman Wiland, Eckhart; four daughters, Mrs. Hazel Rounds, Accident; Mrs. Helena Crowe, Finzel; Mrs. Pearl Wampler, Eckhart; Mrs. Shirley Winner, Frostburg; two sisters, Mrs. Florence Martin, Westernport; Miss Jane Wiland, Atlanta, Pa.; 35 grandchildren and 15 great-grandchildren. Friends will be received at the Newman Funeral Home today from 7 to 9 p.m. and tomorrow and Thursday 2 to 4 and 7 to 9 p.m. Services will be conducted Friday at 2 p.m. in New Germany United Methodist Church. The Rev. Paul Lovejoy, the Rev. Earl Harper, and Mrs. Sadie Triplett will officiate. Interment will be in the church cemetery. The body will be taken to the church at 1 p.m.
Mrs. Thomasine, wife of Mr. Frank Wiland, died at her home in Westernport, Tuesday, May 28th, 1912, of tuberculosis, aged 23 years. Meyersdale, Pa., Jan. 1 — Funeral services will be conducted tomorrow afternoon at the home by Rev. DeWitt L. Miller, pastor of Meyersdale Church of the Brethren, for William Wiland, 63, of Summit township, near Meyersdale, who died unexpectedly late Tuesday morning while at work at the Potter Lumber Company, near his home. Death was attributed to a cerebral hemorrhage. Born March 21, 1878, in Lonaconing, Md., Mr. Wiland was a son of William and Jane (Thompson) Wiland. He had resided near Meyersdale for approximately 40 years. Surviving are his widow, Mrs. Eleanor (Miller) Wiland, and five children — Mrs. Samuel Herwig, Trans-Meyersdale; Mrs. Lloyd Koontz, Pittsburgh; Mrs. Chester Ellenberger, Akron, O.; Mrs. Albert Woerner, Meyersdale, and William C. Wiland, Jr., at home. There are 15 grandchildren. Mr. Wiland was a brother of Michael, John, Jerry, Eli and Cyrus Wiland, Mrs. Albert Richardson, Mrs. Harold Galloway and Mrs. Robert Whitner, all of Akron, O., and Henry Wiland, Lonaconing. Mrs. Annie (Durst) Wilburn, 74, wife of Jason Wilburn, died yesterday at her home in Jennings. Services will be conducted Sunday at 2 p.m. at the Maple Grove Church of the Brethren. Services for Mrs. Annie Wilburn, 74, wife of Jason Wilburn, who died March 11 at her home in Jennings, were held Sunday at the Maple Grove Church of the Brethren. Interment was in Grantsville Cemetery. Surviving besides her husband are five daughters: Mrs. Clara Holder, Sipesville, Pa.; Mrs. Eliza Beebe, Canton, O.; Mrs. Alice Setzer, Condersport, Pa.; Mrs. Sabena Roderick, Cumberland; Mrs. Vera McKenzie, Grantsville; five sons: Roy and Clark Wilburn, both of Baltimore; Norman Wilburn, Eckhart; Elmer Wilburn, Traveres, Fla.; Perry Wilburn, Grantsville; 30 grandchildren and 43 great-grandchildren. Annie Elizabeth Wilburn, 72, of 124 Fosters Inn Rd., Grantsville, Md., died Saturday, April 19, 2003, at her residence. Born September 10, 1930, in Jennings, Md., she was a daughter of the late Lewis and Stella (Stein) Hoover. She was preceded in death by her husband, Denzil H. Wilburn, Dec 31, 1999 and one daughter, Virginia. Mrs. Wilburn was a member of Jennings Church of God and was a retired cook and baker for Penn Alps Restaurant. She is survived by one son, Ricky Wilburn, Grantsville; three daughters, Norma Moyers, Bruceton Mills, W.Va.; Delores Jean Tilgner and Kathy Wilburn, both of Grantsville; one brother, Albert Hoover, Albright, W.Va.; 18 grandchildren and 4 great grandchildren. Friends will be received at the Newman Funeral Homes, P.A., 179 Miller St., Grantsville, Md. on Sunday 2-4 & 7-9 p.m. Services will be conducted in the funeral home on Monday 1 p.m. with the Rev. George Plants officiating. Interment will be in Grantsville Cemetery. Mrs. Katherine Wilburn died at her home in Westernport, Wednesday morning, October 30. The funeral took place Friday afternoon last.Born on Sunday, October 27, to Mr. and Mrs. Elmer Michael, of Westernport - a son. ECKHART — Norman Wilburn, 75, of Parkersburg Road, was pronounced dead on arrival yesterday at Frostburg Community Hospital. He had been in ill health six years. Born at Jennings, he was a son of the late Jason and Annie (Durst) Wilburn. Mr. Wilburn was a retired employe of Celanese Fibers Company and a member of Jennings United Methodist Church. Surviving are his widow, Hazel (Custer) Wilburn; a daughter, Mrs. Mary H. Harris, Frostburg; five sons, Randall Wilburn, Frostburg; Robert Wilburn, Mt. Savage; Donald Wilburn, Barrelville; Dale Wilburn, Frostburg; Robert Wilburn, Mt. Savage; Donald Wilburn, Barrelville; Dale Wilburn, Frederick; and Richard Wilburn, Silver Spring; three brothers, Perry Wilburn, Bittinger; Elmer Wilburn, Florida; Clark Wilburn, Baltimore; four sisters, Mrs. Clara Holder, Fairfax, Va.; Mrs. Vera McKenzie, Wheaton; Mrs. Elva Bebe, Canton; Mrs. Sabina Lampert, Florida; 12 grandchildren and six great-grandchildren. Friends will be received at the Durst Funeral Home today from 7 to 9 p.m. and tomorrow 2 to 4 p.m. and 7 to 9 p.m.
A junior high school student was pronounced dead on arrival yesterday at Sacred Heart Hospital and cause of death was listed as ..."asphyxiation due to aspiration of stomach contents, due to drug overdose," according to Maryland State Police. The victim was Tammie L. Wilburn, 14, of RD 2, Box 37, Mt. Savage, who was transported to the local hospital early yesterday by the Mt. Savage Volunteer Fire Department ambulance. The young girl was an eighth grade student at Mt. Savage School. Born in Washington, D.C., Miss Wilburn was a daughter of Donald and Rebecca (Michael) Wilburn. Besides her parents, surviving are a sister, Connie Marie Wilburn, at home; a brother, Donald Wilburn Jr.; maternal grandparents, Mr. and Mrs William H. Michael, Lonaconing, and paternal grandparents, Mr. and Mrs. Norman Wilburn, Eckhart. Friends will be received at the Hafer-Sowers Funeral Home, Frostburg, today from 7 to 9 p.m. and tomorrow 2 to 4 and 7 to 9 p.m.
Services for Mrs Nora Virginia Wilcher, 81, formerly of Piedmont, who died Monday at the home of her nephew and niece, Dr and C E Montgomery, Keyser, with whom she resided will be conducted this afternoon at the Markwood Funeral Home, Keyser, by Rev Charles W Scragg, Jr. Interment will be in Potomac Valley Memorial Park. A native of Summit Point, Mrs Wilcher was the daughter of Joshua and Mary (White) Carroll. Her husband, Thomas Wilcher, preceded her in death. Mrs Wilcher was a member of Grace Methodist Church and Boyce-Houser Unit 41, American Legion Auxiliary. Besides Mrs Montgomery, she is survived by two brothers, Fred Carroll, Hagerstown and G Dewey Carroll of Elkins. The Herald, Piedmont, Mineral Co, W Va; 4 April 1964. Kenneth E. "Tubby" Wilcox, 82, of 120 Mary Court, LaVale and formerly of Luke, Md. died Wednesday, May 16 at Sacred Heart Hospital at Cumberland. Born in Westernport on May 24, 1918, he was the son of the late Dewey Kenneth Wilcox and Leola Vassar Reeves Wilcox Walker. Mr. Wilcox was retired from Westvaco Corp., with 45 years of service, having been a Supervisor in maintenance. He served with the Fifth Marine Division of the United States Marine corp., and participated in the Battle of Iwo Jima. He was a 50 year member of Hiram Lodge #103 AF & AM of Westernport, a member of the Ali Ghan Shrine of Cumberland, with the Provost Guard Unit, a member of the York Rite Bodies and the Knights of Templer of Cumberland. He was also a member of Kelly Mansfield Post #52 American Legion of Piedmont and the Queens Poin V.F.W. # 6775 of McCoole, Md. He was a former member of the Luke Volunteer Fire Co. and formerly served on the Town of Luke City Council. Surviving are his wife, Mary Mazzone Wilcox; two daughters, Mary Ann Green and husband Ed of Churchville, Md. and Helen Nelson and husband, Dr. Joseph of Cumberland; and four grandchildren; Brady Green and wife Nancy, Captain Kenneth Nelson, M.D., Christopher Nelson and Ryan Nelson. The family will receive friends at the Boal Funeral Home at Westernport Friday from 2-4 and 7-9 p.m. Hiram Lodge will hold a memorial service at the funeral home Friday at 7 p.m. Funeral services will be conducted at the funeral home Saturday at 9:30 a.m. with Father Paul Byrnes officiating. Interment will be at Philos Cemetery at Westernport, where full military honors will be accorded at graveside by various military organizations. Herman Wildeman, 50, of Friedens, Somerset County, died Sunday in Memorial Hospital at Johnstown. He was born in Connellsville July 17, 1900, a son of Augustus and Margaret Domer Wildeman. Surviving are his widow, Mrs. Ruth Ohler Wildeman; three children, one grandchild, two brothers, Charles of Meyersdale and George of Friedens, R.D. 2, and one sister, Mrs. Clarence Robertson of Greensburg. Frostburg - Elmer S Wilderman, 64, of 60 Centennial Street, died yesterday in Miners' Hospital shortly after being admitted. A native of Frostburg, he was a son of the late Edward J and Mary A (Lyons) Wilderman. Mr. Wilderman was employed as custodian at the Aerie 1273, F O Eagles home. A veteran of World War I he had been awarded the Purple Heart medal. He also was a member of St. Michael's Catholic Church and the Eagles lodge. He is survived by three sisters, Mrs. Rose G. Taylor, Ridgewood, N.J.; Mrs. Blanche Lowe, Washington, D. C., and Miss Olive Wilderman at home and a brother, William Wilderman, also at home. FROSTBURG, July 11 - Mrs Mary Wilderman, widow of Richard Wilderman, former residents of Eckhart, died yesterday afternoon at her home in Duquesne, Pa, following illness of several months. Her husband was a well known railroad engineer in this section. Mrs Wilderman was a native of Eckhart and a daughter of the late Mr and Mrs Joseph Groter. Survivors include six children, Mrs Walter Thomas, Duquesne; Lester and John Wilderman, at home; Charles Wilderman, New York City; Mrs Wilbur Stilly, with her husband in Algiers, Africa and Major Gerald Wilderman, with the Army in Japan; two brothers, John and Joseph Groter, Eckhart and four sisters, Mrs Thomas Carter, Mrs Minnie bolt, Mrs Jacon Siebert and Mrs John Williams, all of Eckhart. Services and burial will take place in McKeesport, Pa.
Cumberland Evening Times; Cumberland, Allegany Co, Md - July 11, 1947 - pg 12, col 2. Cumberland Evening Times; Cumberland, Allegany Co, Md - October 17, 1925 - pg 10, col 4. FROSTBURG — Miss Olive Wilderman, 69, formerly of 60 Centennial Street, died Wednesday. Born in Frostburg, she was a daughter of the late Jerdan(sic) and Mary A. (Lyons) Wilderman. She was a member of St. Michael's Catholic Church and was a member and past president of the Sodality. She also was a member of the Third Order of St. Francis at SS. Peter and Paul Catholic Church. Her only survivors are several nieces and nephews. The body is at the Durst Funeral Home where friends will be received from 2 to 4 and 7 to 9 p.m. A requiem mass will be celebrated Saturday at 11 a.m. at St. Michael's Church and burial will be in the parish cemetery. The rosary will be recited today at 8 p.m. at the funeral home. Frostburg, Nov. 22 - Richard Wilderman, 50, native and former resident of this city, died Saturday at his home in Duquesne, Pa. Surviving are his widow, Mrs Mollie G Wilderman; three daughters, Catherine, Madeline and Joan and three sons, Charles Lester and Jordon, cadet at West Point. He was a brother of Miss Olive Wilderman, Mrs Julia McGuire and William and Elmer Wilderman, Frostburg; Edward, Akron, O; Mrs William Warne, Homestead, Pa; Mrs John Henaghan, Mt Savage; Mrs George S Taylor, Pittsburgh and Mrs William Lowe, Cumberland. Nancy Virginia Wiles died on January 17, 2010. She was born November 13, 1916, in Amboy, the daughter of the late A.D. and Myrtle Forman. She graduated from Aurora High School and attended Fairmont State College. She worked for 15 years at the Department of Human Services and was a member of the Womens Club and Eastern Star. She enjoyed sewing, crocheting, quilting and knitting and was an avid reader. Many of her afghans were donated to neo-natal units at local hospitals. She is survived by three children and spouses, Howard Wiles and Carol, of Oakton, VA; Mary Woodruff and Gary, of Jackson, OH; and Martha Wiles¬Mapstead, of Grafton; four grandchildren; four great-grandchildren; and a sister-in-law, Dorotha Forman, of Amboy. She was also preceded in death by her husband, H. Dent Wiles; two sisters, Eleanor Helmick and Erma Forman; and one brother, Fred Forman. At her request, services were private. The family requests memorial donations be made in her memory to Hospice, 7 Harman Center, Suite 203, Grafton, WV 26354 or the charity of your choice. Mr. Wiley, who was working at Pierce, was killed by a freight train at William last Tuesday. Harold W. Wiley, 77, of Grantsville, Md., died Sunday, November 9, 2003, in Ruby Memorial Hospital, Morgantown, W.Va. Born Feburary 17, 1926, in Jennings, Md., he was the son of the late Albert and Pearl (Close) Wiley. He was also preceded in death by three brothers, Lorraine Wiley, February 16, 1970; Marvin E. Wiley, February 5, 1989, and Albert D. Wiley, November 9, 2000. Mr. Wiley was a retired school bus contractor for the Garrett County Board of Education for 55 years. A. U.S. Navy veteran having served in the South Pacific during WW II, he was a 47 year member of Grantsville American Legion, Post 214. He was a member of Woodmen of the World, Camp 41, Grantsville, and Zion Lutheran Church. Harold is survived by his wife of 56 years, Helen (Billmeyer) Wiley; one son, David and wife, Kristi, Rawlings, Md. ; two daughters, Sharon Garlitz and husband, Bill, Frostburg; Lori Ann Kyle and husband, Randy, Grantsville; seven grandchildren: Sheila Bittinger, Cheri Garlitz, Billy Garlitz, Brian Wiley, Ryan Kyle, Andy Kyle and Bryce Dougherty; one great-grandson, Michael P. Garlitz. He is also survived by one sister, Kathleen Sipple and husband, William, Grantsville; and numerous nieces and nephews. Friends will be received at the Newman Funeral Homes, P.A., 179 Miller St., Grantsville, Md., on Monday and Tuesday 2-4 & 7-9 p.m. Services will be conducted in the funeral home on Wednesday at 11 a.m. with the Rev. David E. Fetter officiating. Interment will be in Grantsville Cemetery. Pallbearers will be David Wiley, Brian Wiley, Randy Kyle, Billy Garlitz, Bill Garlitz and Wayne "Tink" Bittinger. Honorary pallbearers will be Grantsville School Bus drivers. Expressions of sympathy may be directed to Zion Lutheran Church. GRANTSVILLE — B. Harrison Wiley, 64, retired government employe, died September 8 at his home in Reisterstown, Md., after an illness of several months. A son of the late Thomas and Lydia (Winterberg) Wiley, he was born in Bittinger. Surviving are his widow, Mrs. Lucy (Glotfelty) Wiley; three daughters, Kathleen, Marian and Carvall Wiley, and four sons, Wilbur, Thomas, Joseph and Roland Wiley. Mr. Wiley had been employed at the Baltimore Custom House until failing health forced him to retire. Funeral services and burial took place Monday in Reisterstown. Attending from here were Blair and Max Buckel, Mr. and Mrs. Elwood Glotfelty, Mr. and Mrs. Kermit Glotfelty, Mr. and Mrs. W. E. Buckel, and Mr. and Mrs. David Broadwater. GRANTSVILLE - Clarence E. Wiley, 58, died yesterday at Sacred Heart Hospital, Cumberland. A native of here, he was a son of the late Grant and Louisa (Bowser) Wiley. A veteran of World War II, he was a charter member of American Legion Post 214 and a member of Christ Lutheran Church. Surviving are his widow Catherine (Pfaff) Wiley; three brothers, Dewey Wiley, Elizabeth, Pa.; Earl Wiley, Gardena, Calif., and Robert Wiley, Huntington Beach, Calif.; two sisters, Mrs. Bessie Herring, Friendsville, and Mrs. Mary R. McKenzie, here. The body is at the Newman Funeral Home where friends will be received from 2 until 4 and 7 until 9 p.m. A service will be conducted there Friday at 11 a.m. Rev. David Fetter will officiate and interment will be in Grantsville Cemetery. The family requests expressions of sympathy take the form of contributions to the American Cancer Society. Cora A. Wiley, 81, Grantsville, died Saturday, April 12, 2003, at Memorial Hospital, Cumberland. Born Oct. 21, 1921, in Grantsville, she was a daughter of the late Rev. A.C. and Sallie (Butler) Walls. She was preceded in death by her husband, Blaine Wiley, May 3, 1986; two daughters, Catherine and Zelda; three brothers, Robert, Herbert, and Lewis Walls; and two grandchildren. She was a retired after 24 years at Flushing Shirt Factory and was a member of Kingdom Hall of Jehovah's Witnesses, Grantsville. She is survived by six daughters, Patricia Gatterman Nelson, Shirley Lapp, Rita Garlitz, and Connie Savage, all of Grantsville, Dorothy Baker, Uniontown, Pa., and Kay Hockman, Accident; two sons, Lewis Wiley, Smithfield, Pa., and Charles Wiley, Frostburg; three sisters, Esther Stanton and JoAnn Bowser, both of Grantsville, and Ruth Gindlesperger, Berlin, Pa.; one brother, Walter Walls, Virginia Beach, Va.; 18 grandchildren; and 17 great-grandchildren. Friends were received at the Newman Funeral Home, Grantsville. A service was conducted in the funeral home on Monday, April 14, with Keith Welch officiating. Interment was in Oak Grove Cemetery. Expressions of sympathy may be directed to Kingdom Hall of Jehovah's Witnesses. Accident - Harvey Wiley, 82, died yesterday at his home near here. Born in Garrett County, he was a son of the late James and Barbara (Myers) Wiley. 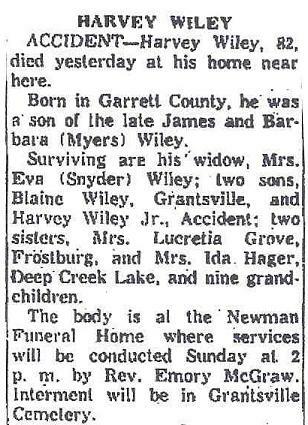 Surviving are his widow, Mrs. Eva (Snyder) Wiley; two sons, Blaine Wiley, Grantsville, and Harvey Wiley Jr., Accident; two sisters, Mrs. Lucretia Grove, Frostburg, and Mrs. Ida Hager, Deep Creek Lake, and nine grandchildren. The body is at the Newman Funeral Home where services will be conducted Sunday at 2 p.m. by Rev. Emory McGraw. Interment will be in Grantsville Cemetery. Grantsville - James Earl Wiley, 64, a native of here, died yesterday at Gardena Hospital, Gardena, Calif. A native of Grantsville, he was a son of the late Grant and Louise (Bowser) Wiley. He was a member of Lutheran Church of the Resurrection at Rendondo Beach, Calif., and a World War II veteran. Survivors include a daughter, Mrs. Christine Mitchell, Hacienda Heights, Calif.; two brothers, Robert Wiley, Westminster, Calif., and Dewey Wiley, Elizabeth, Pa., and two sisters, Mrs. Bessie Herring, Friendsville, and Mrs. Mary R. McKenzie, Grantsville. A memorial service will be conducted Saturday at 2 p.m. at the Newman Funeral Home, Grantsville, with Rev. David Fetter officiating. Interment will be in the Grantsville Cemetery. Death of James P. Wiley, Last Civil War Veteran of Grantsville Community. GRANTSVILLE, Dec. 1-James P. Wiley, aged 87 years, a Civil War veteran and former resident of Garrett County, died at his home at Somerfield, Pa., Saturday evening, Nov. 28. Besides his widow, Mrs. Barbara Wiley, he leaves five sons, Grant, Milton and Harvey Wiley, of Grantsville; Ralph, of New Germany, and Edward of Somerfield, and five daughters, Mrs. Ida Hager, Somerfield; Mrs. Anna Resh, Mrs. Harriet Resh, Bittinger; Mrs. Mintie Keefe, Saltville, Va.; Mrs. Lucretia Groove's, Frostburg. He also leaves 42 grandchildren and 65 great-grandchildren. Funeral services were held in the Grantsville Lutheran Church on Tuesday afternoon, Dec. 1, conducted by Rev. S. D. Sigler, the pastor, assisted by Rev. Pollock of the Methodist Episcopal Church at Addison. The pallbearers were six grandchildren. Members of the Earl H. Opel American Legion Post escorted the remains to the Grantsville Cemetery where a military service was held, a salute was fired and taps sounded for the last Civil War Veteran in this end of the county. A large number of relatives and friends from a distance attended the funeral. GRANTSVILLE — L. Robert Wiley, 79, a native of here, died Monday at Anaheim (Calif.) Community Hospital. He resided in Westminster, Calif. Born here, he was a son of the late Grant and Louisa (Bowser) Wiley. He was a veteran of World War I. He is survived by his widow, Mrs. Freda (McKenzie) Wiley; a son, L. Roberty Wiley Jr., Huntington Beach, Calif.; a brother, Dewey Wiley, Elizabeth, Pa.; two sisters, Mrs. Bessie Herring, Cuppett Weeks Nursing Home, Oakland; and Mrs. Mary McKenzie, here; and three grandchildren. The body is at the Newman Funeral Home, here, where friends will be received today from 2 to 4 and 7 to 9 p.m. A graveside service will be conducted tomorrow at 10:30 a.m. at the Grantsville Cemetery by Rev. William Ferguson. Frostburg - A service for Ralph O. Wiley, 83, of 125 East Main Street, who died Wednesday at his home, will be conducted at the Hafer Funeral Home tomorrow at 10 a.m. Rev. George L. Wehler will officiate and interment will be in Grantsville Cemetery. Bittinger.- Thomas B. Wiley, former Treasurer of Garrett county, is dead at Bittinger, aged 70 years. He served in the Union Army in the Third Cavalry, Potomac Home Brigade, and saw service in the Valley of Virginia. He was twice married. His wife and 11 children survive. Ulysses Grant Wiley, who would have been 86 in June, died at the home of his daughter, Mrs. Harley McKenzie, Friday, May 8. He has been confined to his bed since January. He was born at Bittinger, Md., June 22, 1867, son of the late James P. and Barbara (Myers) Wiley. He was married to Louise C. Bowser, who died in 1920. For 25 years he was a stateroad patrolman and has resided with his daughter since the death of his wife and his retirement. He was the oldest resident of Grantsville and was a Republican having been one of the oldest resident voters in the last election. He was a member of the Lutheran Church. He is survived by two daughters, Mrs. McKenzie and Mrs. Bessie Herring, Baltimore, and four sons, Clarence Wiley of Grantsville, Robert Wiley of Los Angeles, Calif., Earl Wiley of San Diego, Calif., and Dewey Wiley of Clairton, Pa.; Two brothers, Ralph Wiley, New Germany, and Harvey Wiley, Grantsville; three sisters, Mrs. Simon Resh, Grantsville, Mrs. Lucretia Groves, Frostburg, and Mrs. Ida Hager, Akron, 31 grandchildren and 24 great grandchildren also survive. Services were held in the Lutheran Church here Monday afternoon with the pastor, Rev. George E. Bowersox and Rev. Donald Hinkle, Methodist pastor, officiating. The Springs Mennonite Choir sang, the pallbearers were George Diefenbach, Stewart Rodamer, Ray Lohr, and Harold Miller, Daniel Klotz and O. J. Glotfelty. Interment in the Grantsville Cemetery. Relatives who attended the funeral were Mr. and Mrs. Robert Wiley Los Angeles, Calif., Mrs. Ada Hagar, Akron, Mrs. Lucretia Groves, Frostburg, Mrs. Ella Cuschleg, Mrs. Grace Shaffer, Mr. and Mrs. Paul Bowman and son of Wadsworth, O.
GRANTSVILLE - William E. Wiley, 67, died yesterday at Meyersdale Community Hospital. A native of Jennings, he was a son of the late James and Adeline (Bower) Wiley and was a member of Zion Lutheran Church, Jennings. Surviving are his widow, Violet (Hollada) Wiley; a son, William C. Wiley; two daughters Mrs. Lois Watson and Mrs. Dixie Winebrenner, here; two brothers, Cortez and Stanley Wiley, here; a sister, Mrs. Rosie Frye, Akron, Ohio, and four grandchildren. The body is at the Newman Funeral Home where friends will be received from 2 until and 7 until 9 p. m. A service will be conducted there Sunday at 2 p. m. with Rev. Guy Ludwig officiating Burial will be in Grantsville Cemetery.